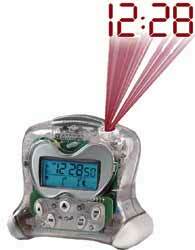 The RM313PA alarm clock makes going to bed or waking up fun. Cool and colorful, this member of the ExactSet family has all the amazing attributes of the other ExactSet clocks. It sets itself automatically, self-corrects for daylight savings time and projects the time in soft glowing red numbers on the wall or ceiling. Now you can have ExactSet accuracy all the time. These cool and curvaceous clocks not only look good, but they are easy to use and operate. The radio tower icon on the LCD screen lets you know your ExactSet projection clock is tuned in and receiving the super-accurate Atomic Clock time. Actual size: 4.25" x 2.5" x 4.5"